This paper reports the successful syntheses of Mg/Mo co-doped thermochromic vanadium dioxide nanorods by hydrothermal technique. In particular, the effect of magnesium and molybdenum co-doping on insulator–metal transition of vanadium dioxide was investigated. 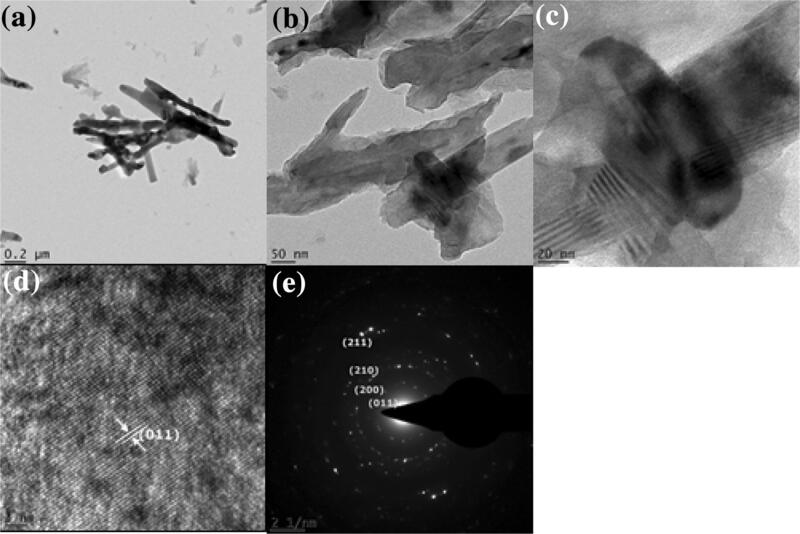 The synthesized Mg/Mo co-doped VO2 nanorods exhibited high purity and crystallinity. X-ray diffraction, scanning electron microscopy, X-ray energy-dispersive spectrometer, transmission electron microscopy, and Fourier transform (FTIR) were used to study the structure and morphology of the as-synthesized rods. X-ray diffraction patterns of the samples show an increase in intensity and a slight shift in the peaks toward lower 2-theta with increasing dopant concentration. The co-doping reduces ΔTc and has been considered as an effective method for manipulating the phase change in VO2. The results revealed that smart radiation devices based on Mg/Mo co-doping of VO2 can be a promising material for thermal control of spacecraft. Vanadium dioxide (VO2) is one of the intensively studied oxides of vanadium, which undergoes a first-order-type insulator–metal transition (IMT) at a critical temperature (Tc) of about 68 °C [1, 2, 3, 4, 5]. The temperature-dependent IMT behavior of VO2 is reversible from a semiconducting monoclinic structure to a metallic tetragonal structure, accompanied by remarkable changes in electrical and optical properties [1, 3, 5]. During the IMT, the electrical conductivity of VO2 increases by more than three orders of magnitude [1, 2]. Recently, reducing the phase transition of VO2 closer to ambient temperature and exploiting this property for applications in diverse areas of technology have been a hot research topic [3, 4]. Lowering the phase transition of VO2 can be achieved by different driving mechanisms such as doping [4, 6, 7, 8], light illumination [9, 10], and application of electric field , which in turn alters the physical properties of VO2 and exhibits unusual properties in its electrical and optical performances. These remarkable properties bring thermochromic VO2 to the front line in the manufacturing of future technological devices such as smart window coatings [12, 13, 14, 15], smart radiation device (SRD) [16, 17], terahertz (THz) optical devices , electronic switches and memories [19, 20, 21], Li-ion batteries [22, 23], and thermal sensors [24, 25, 26]. To date, various synthesis techniques have been employed to prepare vanadium dioxide nanoparticles. These include thermolysis [6, 14, 27], sputtering [16, 17], spray pyrolysis , ion implantation [29, 30], chemical vapor deposition (CVD) [31, 32], pulsed laser deposition (PLD) [33, 34, 35], sol–gel [27, 36], and hydrothermal techniques [8, 37, 38, 39]. Among these, hydrothermal synthesis technique is environmentally friendly, cost-effective, flexible, does not need complicated setup and can be scaled up easily for mass production [8, 37, 38]. So far, many research works have been conducted using this method for the syntheses of undoped and doped VO2 nanoparticles [8, 38, 39]. Doping VO2 with transition metal is a commonly practiced technique to change (increase or decrease) the phase transition temperature [40, 41]. Doping of VO2 has been observed to appreciably affect the phase transition temperature and improve the electrical and optical properties of the material [4, 7, 8]. Though single-element doping is an important mechanism to alter the phase transition property, better switching of the phase transition of VO2 was observed by more than one element doping. For instance, Burkhardt et al. prepared tungsten and fluorine co-doping of VO2 and reported that more than one element doping is effective than single-element doping. Kong et al. synthesized W and Mo co-doped VO2 microrods via hydrothermal technique. The result showed that the phase transition temperature was decreased using this material. In this study, we report for the first time the synthesis of Mg/Mo co-doped VO2 nanoparticles using hydrothermal technique. In this eco-friendly and cost-effective synthesis process, the effective hysteresis loop width of Mg/Mo co-doped VO2 nanoparticles was reduced to ΔTc of ~ 8.8 °C, which is an important indication for fast switching application in SRD and smart windows. The chemicals used in this experiment were oxalic acid (C2H2O4·2H2O), vanadium pentoxide (V2O5), ammonium molybdate ((NH4)6Mo7O24·4H2O), magnesium chloride hexahydrate (MgCl2·6H2O), and distilled ionized water. All the chemicals were analytical grade and used without further purification. The chemicals were purchased from Sigma-Aldrich, South Africa. Mg/Mo co-doped VO2 nanorods were synthesized by a hydrothermal method as described in the previous report . In a typical synthesis procedure, 3.56 g of oxalic acid (C2H2O4·2H2O) was first dissolved in 100 mL of distilled ionized water with constant magnetic stirring at room temperature. The addition of oxalic acid is to act as a reducing agent to control the electronic valence of vanadium ions and hence control the successive phase transformation into VO2 (M) [44, 45, 46]. Subsequently, 2.0 g of V2O5 was added to the solution to reach a yellow suspension (V5+) while heating at about 60 °C. The solution turned green and then dark blue (V4+) with final pH value between 2 and 3. After sufficient reaction, 0.5 at.% of (NH4)6Mo7O24·4H2O and different concentrations of MgCl2·6H2O (x = 1.0 at.% Mg, 2.0 at.% Mg, 3 at.% Mg) were added, simultaneously, into the above solution and the suspension was continuously magnetic stirred. An adequate amount of the mixture was transferred into a Teflon-lined autoclave (20 mL) followed by hydrothermal treatment at 240 °C for 6 h. After cooling to room temperature, the resulting blue-black precipitate was separated by centrifugation and then washed with deionized water three times. The product was oven-dried at 80 °C and vacuum-annealed at a temperature of 500 °C to get the less stable polymorph VO2 (M) [47, 48]. 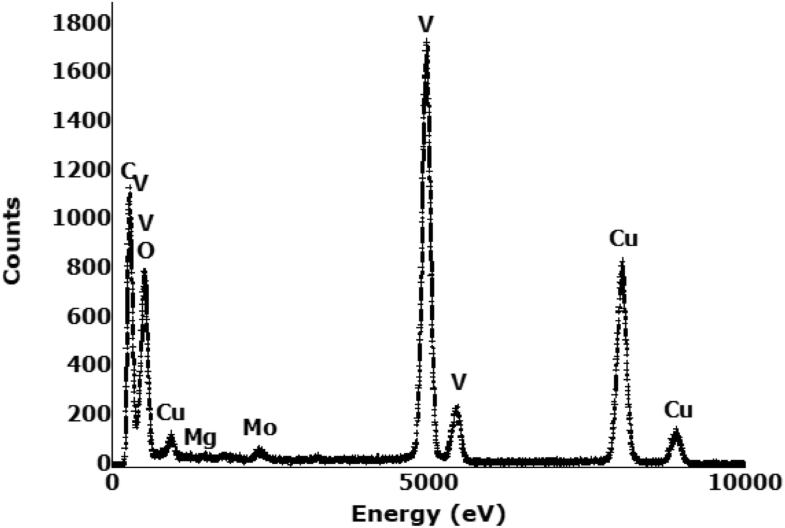 The X-ray diffraction (XRD) patterns of the as-synthesized undoped and Mg/Mo co-doped VO2 powder were collected on a Bruker D8 ADVANCE GER, X-ray diffractometer recorded in the 2-theta range 15°–90° using CuKα1 radiation (wavelength = 1.5406 Å). The operating voltage and current were 40 kV and 300 mA, respectively. The XRD characterization was carried out at iThemba LABS, South Africa. The scanning electron microscopy (SEM) images of the synthesized undoped and Mg/Mo co-doped VO2 powder were obtained using ZEISS, Auriga, Oxford Instruments, field emission scanning electron microscopy. No special sample preparation was required for SEM measurement. The synthesized powder of each sample was carefully spread over the sample holder and was made conducting. The transmission microscopy (TEM) images of the synthesized undoped and Mg/Mo co-doped VO2 powder were recorded on a TECNAI G2-F20. For TEM, about 0.1 mg of the powder was dispersed in 5 mL ethanol. Then, TEM samples were prepared by placing a drop of the particle solution on a carbon-coated copper grid and dried at ambient temperature. Elemental composition was examined through energy-dispersive X-ray spectroscopy (EDS) on the same high-resolution electron microscopy unit. 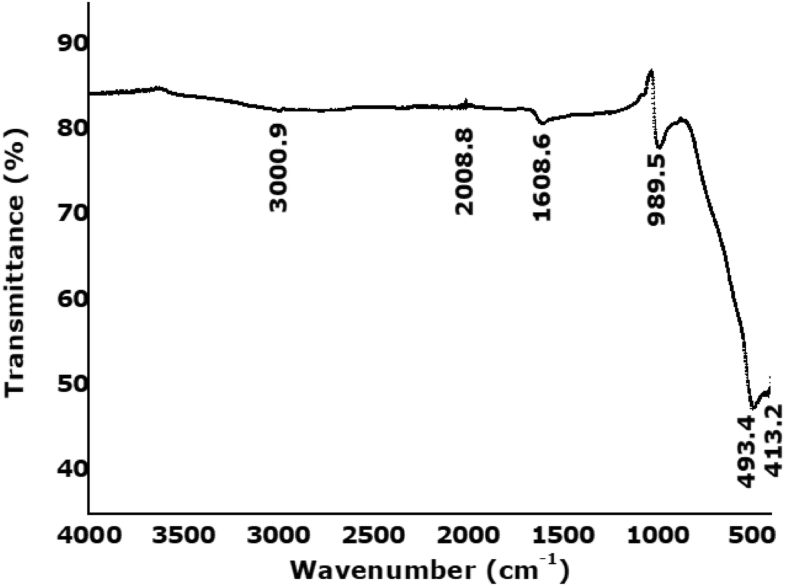 FTIR spectra of undoped and Mg/Mo co-doped VO2 powder were recorded on a PerkinElmer Spectrum 100 spectrometer in the 4000–500 cm−1 range at the University of the Western Cape (UWC), South Africa. Samples were heated from 20 to 90 °C and cooled back from 90 to 20 °C at a rate of 5 °C/min using STA6000 temperature scan. The X-ray diffraction (XRD) patterns of Mg/Mo co-doped VO2 powder with 0.5 at.% Mo and various doping concentrations of Mg (1 at.%, 2 at.%, 3 at.%) are shown in Fig. 1. The peaks of the corresponding XRD pattern are indexed to VO2 (M) phase (space group: P21/c) with lattice constants of a = 5.753, b = 4.526, c = 5.383 Å, and β = 122.60° (JCPDS No. 44-0252). The XRD patterns of Mg/Mo co-doped VO2 exhibit diffraction peaks at 26.93°, 27.86°, 33.46°, 37.03°, 39.83°, 42.19°, 44.67°, 52.94°, 55.51°, 57.48°, 65.08°, 70.43°, and 72.03° corresponding to (110), (011), (10-2), (200), (002), (210), (021), (102), (211), (022), (031), (202), and (41-1), respectively, with prominent peak at (011) (JCPDS no. 44-0252). The XRD patterns exhibited that the Mg/Mo co-doped VO2 nanorods were monoclinic phase. No peaks of any other phase or impurities were detected in the spectra, revealing high phase purity of VO2 (M) nanorod structure. From the XRD pattern, it is clearly seen that the intensity of the peaks found to exhibit a slight increment with increasing dopant concentration, which means that the crystallinity of VO2 (M) is increasing with dopant level. The size and morphology of the Mg/Mo co-doped VO2 are examined by scanning electron microscopy (SEM). As shown in the magnified SEM image of Fig. 2, the products are rod-shaped particles with a length of about 490 nm and width of 137.6 nm. Figure 3a–d shows the transmission electron microscopy (TEM) images of Mg/Mo co-doped VO2 which provides additional information on the phase of the VO2 (M) sample. As shown in Fig. 3a, b, the morphology of the Mg/Mo co-doped VO2 is rod-shaped structure. The SAED patterns in Fig. 3e show the rods exhibited crystalline structures and clear lattice fringes of VO2 (M) phase. The spacing between two successive crystal planes was calculated to be around 3.21 Å, which is consistent with the distance between two (011) crystal planes of VO2 (M). With an increase in Mg doping level from 1 at.% to 3 at.%, an increase in aspect ratio of the Mg/Mo co-doped VO2 nanorods was observed [5, 49]. This reveals that increasing level of dopant concentration promotes the growth of VO2 (M) nanorods . To determine the chemical composition of Mg/Mo co-doped VO2 nanorods, energy-dispersive X-ray spectroscopy (EDS) measurements were taken on a representative specimen. The EDS result as shown in Fig. 4 reveals that the nanorods contain V, Mg, Mo, and O. From the EDS spectrum, it is observed that VO2 was doped with about 1.0 at.% Mg and 1.2 at.% Mo. For all doping concentrations, EDS spectrum was taken and the Mg and Mo elements were observed. The C and Cu peaks observed in the spectrum were from the instrument. As shown in Fig. 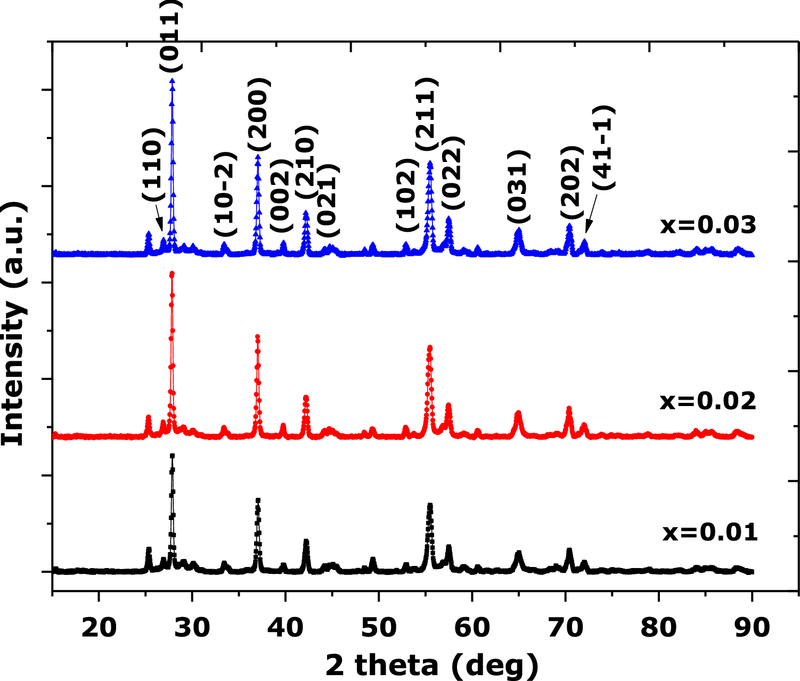 5, the Fourier transform infrared (FTIR) investigations of Mg/Mo co-doped VO2 nanorods were performed. From FTIR studies, we can determine the constituting elements and its bonding arrangement, since each specific molecule possesses a unique fingerprint which can reveal its identity . As a result, the absorption band at the vicinity of 989.5, 493.4, and 413.2 cm−1 can be associated with stretching vibrations of V–O and V=O . A small peak at 1608.6 cm−1 was observed which is due to the adsorbed water molecules . No other significant peaks were observed due to the elimination of surfactants if any. The DSC curve shown in Fig. 6 reveals that the magnitude of effective hysteresis loop width of Mg/Mo co-doped VO2 is reduced to ΔTc of ~ 8.8 °C. Based on the experimental results, XRD peaks shifting toward lower two-theta is an indication of phase transition due to Mg/Mo co-doping of VO2. The presence of Mg and Mo atoms in the EDS spectrum reveals that Mg and Mo atoms have been incorporated into the vanadium atom sites. 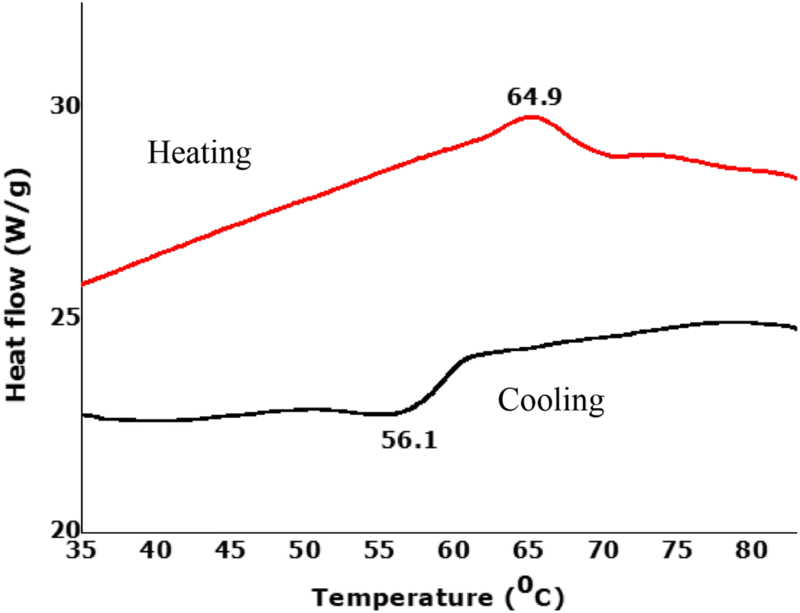 From DSC curve, the phase change between the heating and cooling processes is found to be about 8.8 °C. Here, we compared our result with formerly reported values from the literature, as listed in Table 1. Liang et al. carried out a series of cooling DSC measurements and obtained Tc value of 60.6 °C at 0.5 at.% W doping and the Tc decreases with increasing dopant concentration. Zhou et al. reported Tc ~ 66 °C at 0.7% Mg doping, which decreases with increasing dopant level. Shen et al. reported Tc value of ~ 68 at 4.2% Zr doping and 64.3 °C at 9.8 at.% Zr doping. Only the heating or cooling Tc values are recorded, and thus, the ΔTc value of transition metal doping has not been reported so far. As clearly observed from Table 1, our result includes both the heating and cooling conditions of the sample and the ΔTc ~ 8.8 °C value is clearly calculated. In addition to the presence of phase change owing to co-doping, the result revealed that much smaller value in ΔTc ~ 8.8 °C is achieved in this research work. This implies that the synthesized VO2 nanorods can be a suitable candidate material for SRD and smart window coatings. 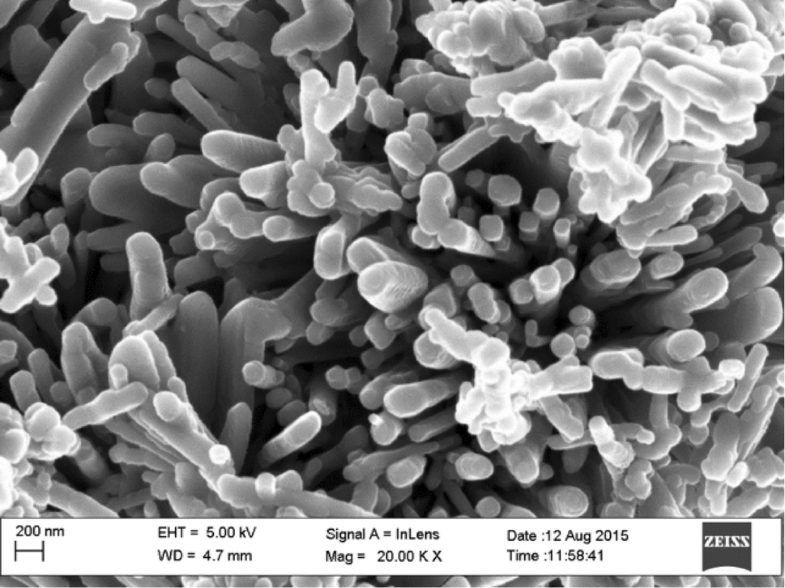 In summary, Mg/Mo co-doped VO2 nanorods were successfully synthesized by hydrothermal technique. The phase transition temperature decreases slightly with increasing level of dopant concentration. The obtained result indicated that Mg/Mo co-doping could be effectively used to lower the phase transition temperature of VO2 toward ambient values. Hence, Mg/Mo co-doping of VO2 is the best candidate material for producing passive thermal control SRD of spacecraft systems as well as for thermochromic smart window coatings. 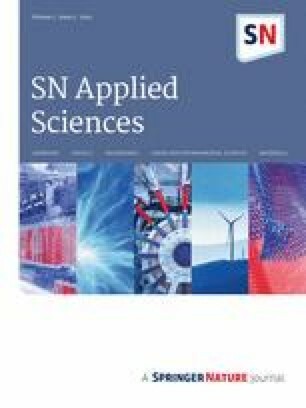 As a follow-up study on these VO2-doped nanorods, it is tended to carry out investigations on their gas sensing, optical limiting, and plasmonic responses as well as their electrochemical characteristics [1, 52, 53]. Likewise, their deep-space radiation hardness will be investigated via proton irradiations . The authors would like to thank the UNESCO-UNISA Africa Chair in Nanoscience and Nanotechnology (U2ACN2) and the Nanosciences African Network (NANOAFNET), iThemba LABS as well as the National Research Foundation (NRF) of South Africa for their financial and material support. The authors are also grateful to the Physics Department at the University of Western Cape (UWC), South Africa, for the SEM and TEM characterizations. Prof. Malik Maaza contributed to conceptualization; Asratemedhin Bekele provided the methodology and wrote the original draft preparation; Dr. Daniel Manaye helped in writing, reviewing and editing and performed the formal analysis; Prof. Malik Maaza participated in supervision and funding acquisition.